Bel-Air Beach Club's online web presence was in need of a redesign to suit the needs of excited beach-goers and condo owner's alike. With a wide range of clientele, the site needed to be user-friendly, functional on multiple platforms and display the beauty that the Fort Myers beachfront has to offer. Tired of seeing the same, generic layout and conventional style of a typical vacation website, Bel-Air was ready to push the creative limits and bring a fresh approach to web design with a side menu layout. 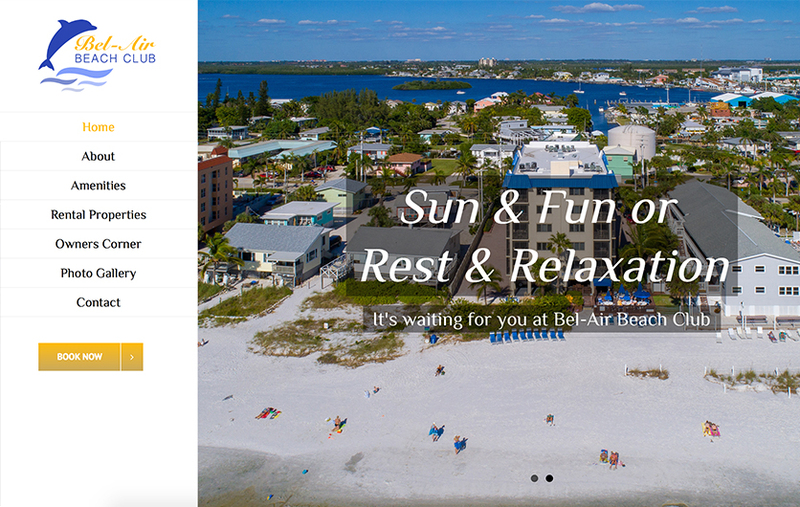 The site's web design is fresh and cutting-edge leveraging vibrant resort-centric imagery that fits within the context of the Bel-Air as a premier Fort Myers destination. 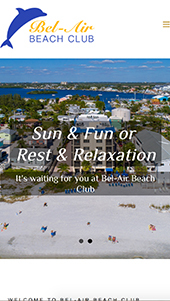 Bel-Air Beach Club is beachfront property located on the Quiet North side of the island just steps away from Fort Myers Beach town square and pier. This 20 unit building is home to many and vacations for others. The all suite 2 bedroom, 2 bathroom units have fully equipped kitchens, in-unit laundry and are available for short or long-term accommodations to suit all travelers needs. Step one toward revamping the site was to identify the main groups of users coming to the website: vacationing beach-goers and condominium owners. From there, key user flows and critical calls-to-actions could be established and a new, streamlined site map was created. The homepage effectively features a variety of topics as doorways into the site, while minimizing information overload.